Ruben Brandt, Collector offers a surreal reminder of the potential for animation. Once more, and extra loud for the people in the back: Animation is not a genre; it is a way of telling a story. Animated feature filmmaking has been associated for generations with kid-friendly fare in this country, but despite that, there's a whole wide world of creative people out there who understand that you can tell all kinds of stories for all kinds of audiences with animation, and it doesn't have to be limited to bright and shiny CGI. From the emotionally complex narratives of Studio Ghibli to work from indie iconoclasts like Nina Paley, there really are as many different ways to explore a narrative through animation as there are through live action; it simply feels as though we've self-selected ourselves into a restrictive box of Disney/Pixar, DreamWorks and Blue Sky. And then there's Ruben Brandt, Collector—the feature debut from Hungarian filmmaker Milorad Krsti—which bursts out of the screen like a surrealist psychological thriller crossed with Ocean's Eleven. The basic plot is in some ways fairly easy to describe: Ruben Brandt (voice of Iván Kamarás), a successful art therapist, has been experiencing vivid nightmares connected to images from famous works by celebrated painters—Boticelli's "Birth of Venus," Manet's "Olympia," Hopper's "Nighthawks" and more. Convinced that the way to end his nightmares is to get these masterpieces physically into his possession, Brandt enlists the aid of several of his patients who also happen to be thieves, led by the daring cat burglar Mimi (Gabriella Hámori). Thus begins a globe-trotting gathering of the artworks, with detective Mike Kowalski (Csaba Márton) in pursuit. The heists themselves might have been little more than an afterthought, but Krsti proves to have a deft touch as an action director. An early extended car chase eventually gives way to Kowalski's purtuit of a physics-defying Mimi, who handsprings, pirouettes and jackknifes across the cityscape like The Matrix's Trinity. Later, the crew attempts to steal Andy Warhol's "Double Elvis" at a Pop Art exhibition; a somewhat tired setup suggesting that gullible patrons could be convinced anything is performance art morphs into a mix of gunfight, fistfight and a game of pass-the-baton with the rolled-up canvas. Brad Bird has long been in a league of his own as a choreographer of animated action; Krsti gives him a run for his money. The real draw, though, is Krsti's wildly inventive approach to illustrating his story. The characters themselves are stylized in ways ranging from a basic but blocky human face to cubist-inspired visions where it's simply accepted that someone has three eyes or a nose embedded in an ear. Every shot is dense with background detail: a boxing match where the fight involves the two guys just making punching noises; a zoetrope being powered by a hamster wheel; an air freshener hanging from a car's rearview mirror in the shape of a Yojimbo-esque dog with a severed hand in its mouth; and Ruben's fondness for making his drinks with ice cubes in the shape of Alfred Hitchcock's profile. The nightmare sequences—with works of art turning homicidal—are often genuinely creepy, and while it's possible that Krsti's game of "spot the reference" might grow tiresome, there's never a moment of Ruben Brandt that isn't working to grab your attention visually. It would have been nice, of course, to have a narrative as engaging as the aesthetics. None of the characters are particularly compelling—despite the attempt to build Ruben's psychological problems on childhood trauma—and the "dogged detective on the case" subplot is completely perfunctory until Krsti drops in a plot twist that feels horribly misguided. It seems almost essential that weird things are happening in the background of every scene, because the conversations in the foreground generally feel like a necessary evil on the way to the next set piece. 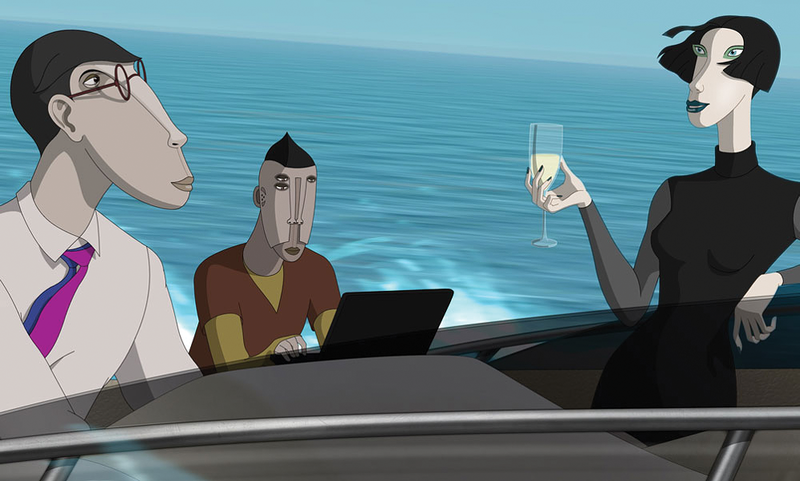 But Ruben Brandt, Collector does the job of reminding you that there are an infinite number of ways to use the unique properties of animation in service of a story. The features of these characters might be square, but the sensibilities of creators don't have to be.